Holy comments, Batman! I’m truly flattered by the love for the Blue Thistle jacket, and I’m working my way through to say thanks and answer questions. I was especially tickled that so many first-time commenters came out of the woodwork – thanks, new readers and not-so-new readers chiming in for the first time! Since you all seem to like seeing new sweaters, it’s convenient that I can finally unveil a secret knit that was finished in November. I’m seeking permission to bring a photo over here, but for the moment you can skip over to the ShibuiKnits page to peek at Spring Thaw! 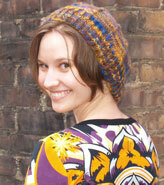 And why, yes, I am just a little bit pleased to be finally modeling the sample of my first published pattern. And while you’re over there, you can also take a gander at my Ivy Socks – I’ve been sitting on these puppies since July. Whew! It feels good to have these knits out in the world! The patterns are available from Knit/Purl, or from your local ShibuiKnits retailer. Less than 48 hours until I leave on my pre-dawn drive to Tacoma for a heavenly weekend of Madrona workshops! I get to bask in the wisdom of knitterly goddesses Nancy Bush and Lucy Neatby, my friends. And will any of you be in attendance? I hope we’ll meet in perusing the booths of yarny goodness. I’ve decided to allow myself a skein or two from Blue Moon’s Raven Clan (if there’s any left), because I think it’s such an interesting experiment to do a whole run of different black colorways, and because there’s no black yarn in my stash, but throw yourself between me and the credit card swiper if you see me reaching for anything else, okay? Look for a full report on Monday!